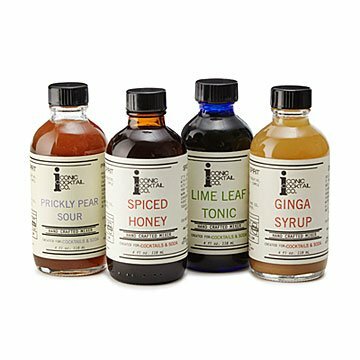 Mix up craft cocktails easily at home with this set of four flavorful drink mixers. Friends are gathered. Your favorite song just came on. Everyone's talking about the craft cocktails. No, you're not at a trendy new bar. You whipped up that batch of delicious drinks at home and earned major hosting points with this set of four flavorful mixers. Handcrafted by Kaylee Nedley and Matt Farrow, each is designed to boost your favorite spirit in a flash. Just pick the alcohol of your choice, mix in the desired flavor (ginga syrup with whiskey, for example), and add a squeeze of lemon or lime juice. Each mini bottle makes four drinks, so you're all set for that cocktail party. When you're not the one home bartending, the set makes a fun hostess gift or thoughtful present for a budding mixologist. Handmade in Arizona, where the prickly pear plant is native. Kaylee Nedley and Matt Farrow run their business with “heaps of passion and optimism.” That might be because they’d always wanted to own their own bar, but ended up doing something else they love--making and selling their craft cocktail mixers. The couple spent the end of 2015 creating seasonal flavors and developing their signature Ginga Syrup and Spiced Honey. They made and sold about 100 bottles from home that Christmas, and realized that it was just the beginning. As they grew their business, they moved to a commercial kitchen in Phoenix, AZ, but everything they make is still produced in small batches and their bottles are filled, sealed, and labeled by hand. They still want to open a bar someday, but for now they’re busy imagining new flavors and producing fresh batches of their classics with the help of their “small but mighty” team. These mixers are so great for cocktails, coffee, tea, Lacroix. They are made with love and care with people who are very passionate about what they do. You will not be disappointed! Cheers! My go to client gift! I can't wait to give this little variety pack to one of my clients. I know he appreciates unique flavors and has been looking for something like this. This will be a perfect addition to his home bar. I'm excited to hear about the prickly pear margaritas he'll be making. Hope I get one!